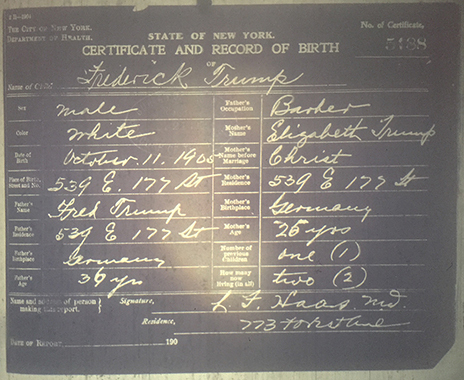 Why Has Donald Trump Been Saying His Father Was Born In Germany? Among the many things Donald Trump appears confused about these days is the matter of where his own father was born. But while Trump’s mother Mary was, in fact, born in Scotland in 1912, his father was not a German citizen. 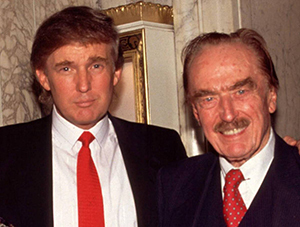 Frederick Trump--who would go on to distinguish himself by getting arrested at a KKK rally and conspiring with Donald to keep blacks out of their Brooklyn apartment buildings--was actually born in the Bronx in October 1905. TSG dispatched a team of investigators in search of the elder Trump’s birth certificate--and they cannot believe what they're finding! Actually, we sent a reporter to New York City’s Municipal Archives to look through old Department of Health microfilm reels. And, as seen above, there is a long-form birth certificate to prove it (click to enlarge).